I ended December and started January with grand plans. I was going to make time daily to get out and shoot, I was going to be more diligent about blogging my favorite shot of the week and I was going to find my passion again. Funny how that works out, I could blame the weather after all we had a Polar Vortex. I could blame so many things but the truth is much more personal and painful. I tried to explain it to someone last night and in doing so realized I did have a post. I have a new cat “Nippers”. We have bonded quite well all things considered. Nipper’s was a stray not a true feral but we had been dancing around each other since early spring. Late October Nippers finally made the move to visit inside and a few weeks later she had settled in. She loves her new home and is without a doubt happy. I believe she would not change a thing. Even when she sits and stares for long periods of time out the window at the world she played, hunted, slept and belonged in. Sure she would love to be climbing that tree and stalking those birds but she is where she belongs. That is my life right now too. I am grieving still for my mom, stuck as I walk through these last few weeks leading up to her being gone a year, Grieving for a son I miss dearly and a little surprised how quickly the years are flying by without him. I am saddened watching the struggle my dad is going through and so amazed by how brave and funny and excepting he has been with the changes cancer brings to a body. But I am happy, content, and at peace with my life. Yes I am looking out the window right now at the places I cannot go shoot and the light and shadows and compositions I am missing right now. But like Nippers I am turning away from that window and finding new ways to construct my time and my days in this new role I find myself in. Nippers will always be a cat and I yes I will always be a photographer. 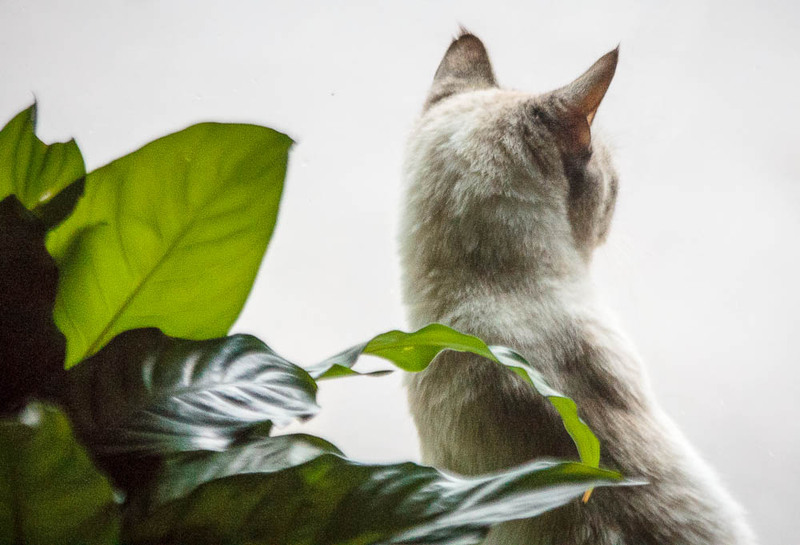 This is a beautifully written post… and what a pretty kitty! Be kind with yourself, be gentle, have no expectations – there is no road map to grief, we each tread one path – our own.